The main screen immediately loads any existing playlists. 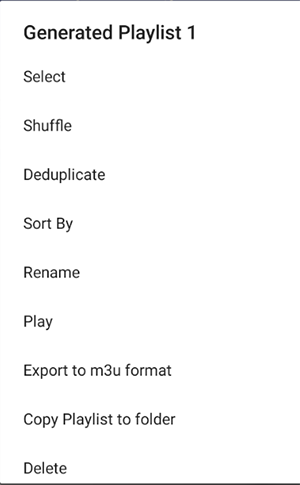 If none exist, use the floating button to add a new playlist. 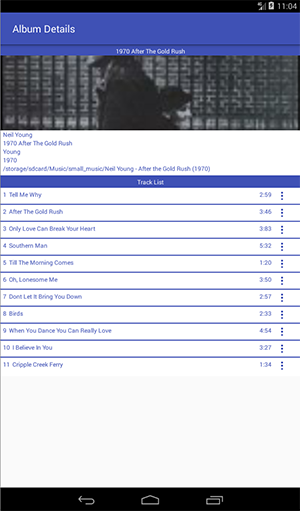 For larger tablets, both the playlists and the tracks of a playlist are shown at the same time. Playlists are displayed on the left whilst playlist tracks are displayed on the right hand side. For smaller screens, playlist detail is accessed by tapping a playlist. The main screens for both types of devices are shown. 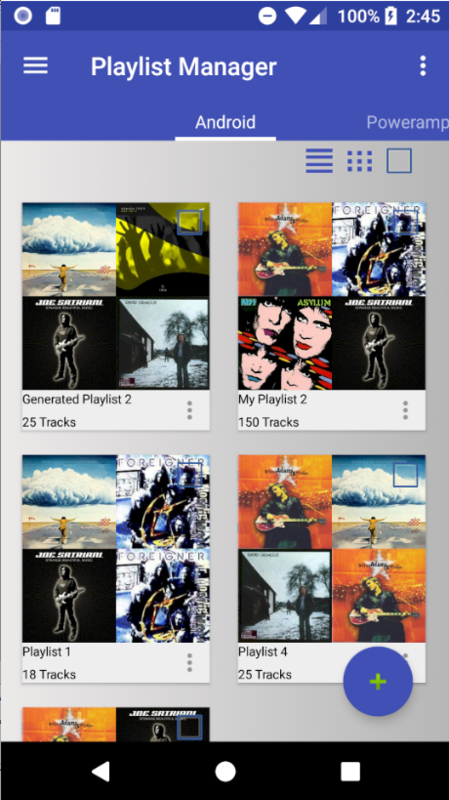 add a new playlist and add a set number of randomly selected tracks or albums. From the Navigation Drawer, select "Libary". 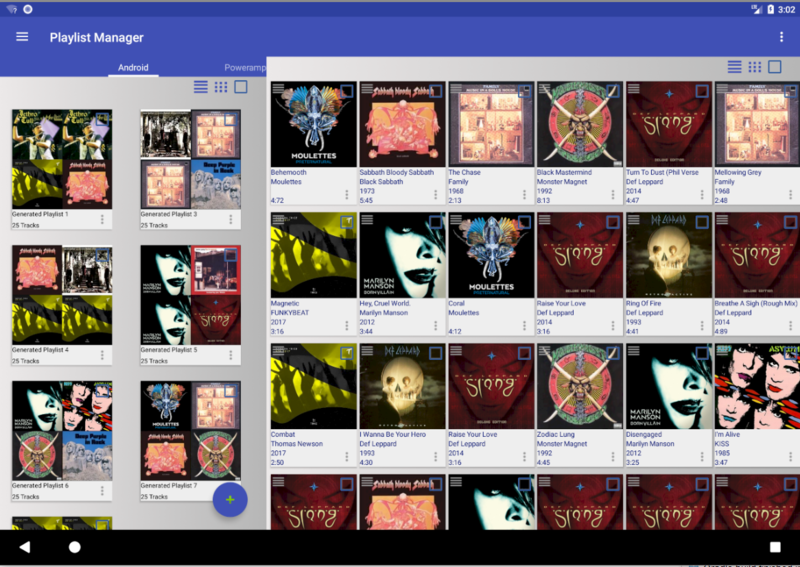 Tracks, Album and Artists views are presented as tabs, although the Track view is the default. You can switch to Albums, Artists or Tracks simply by selecting the appropriate tab. A single click on a track will start to play. 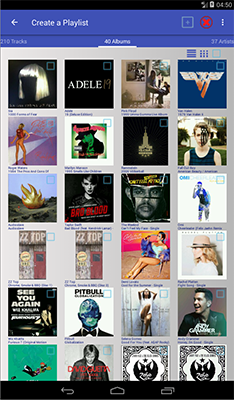 When accessing the Album tab, a single click will bring up album details as shown. Selecting a track from the list will start to play. Clicking the albumart will enlarge your albumart. Quick Query Tool. 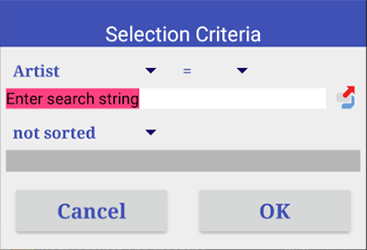 This tool allows you to select tracks using a number of criteria. For instance when you do not know the artist but know part of the song title, this tool will fetch all tracks matching your criteria.